18. June 1999. Izdaje NIP „GLAS“ a.d.
KOSOVSKA MITROVICA - A Serb monastery Devic, in vicinity of Kosovska Mitrovica has been ransacked and its nuns attacked, with Kosovo Liberation Army fighters implicated in the incident, a French army officer said to Reuters on Thursday. A France patrol arrived in Devic on Thursday and found there several uniformed terrorists who at first shouted 'NATO', 'NATO' and then beat a hasty retreat. "We found a priest and nine nuns. He had been beaten and the nuns abused. The youngest and prettiest nun was in tears, collapsed in a chair. We think she had been molested," he said. PRISTINA - Last two Serbs from the village of Sofajlija, near Pristina, were killed, and their bodies were found on Thursday. The killed persons are Vladimir (68) and Persa (66) Stanisavljevic, their relatives said. The relatives, who intended to visit Stanisavljevic family on Thursday, found their bodies on threshold of their house. The relatives suppose that they were killed three days ago when all the others Serbs left Sofajlija. BELGRADE - Serbian Ministry of justice stated on Thursday that prisoners from penitentiaries in Kosovo had to be temporally removed, because of their safety, in other prisons in Serbia. The Ministry delegated a representative, who will give precise information about removed prisoners to their families, in the rooms of Executive chamber of Kosovo and Metohija in Pristina. BONN- A German soldier stationed in Macedonia as part of the Kosovo peacekeeping force shot himself on Thursday, the German Foreign Ministry Spokesman said. According to German daily the "Bilt", there are no precise information about that accident, which occurred around 9.00 a.m., on the road between Strumica and Skoplje. The soldier, who was settled in Tetovo, was riding as a passenger in a medical vehicle en route from Strumica to Skoplje, when suddenly pulled out his pistol and shot himself, "Bilt" reported. BELGRADE (Beta) - Serbian Orthodox Church head Patriarch Pavle left for Kosovo and Metohija early on Thursday, following his late Wednesday's appeal to the Serbs and Montenegrins not to leave their ancestral homes in Kosovo. "Brothers and sisters, I beg you fatherly and appeal to all of you, who have been living and suffering in Kosovo and Metohija, not to leave your ancestral homes and holy sites," Patriarch Pavle was quoted by the Serbian state television (RTS) as saying. Serbian Church head said that he was going to the monastery of Pec, "his original and main seat," announcing that he intended to stay there for a longer period, together with his "spiritual children and all well-intentioned people who live there". "I will lobby by all available means with all competent bodies of our government, as well as with high-ranking representatives of the international peacekeeping forces in Kosovo and Metohija, for your lives, property, for your protection and safety," Patriarch Pavle said, adding that he would demand the same for all other citizens of the Province, regardless of their religious or national affiliation. He said that "Our Lord and Savior taught us that those who endured till the end would be saved", noting that God would help "if we turn to him and remain faithful to him". Patriarch Pavle also said that he would have come to Kosovo even earlier had his health condition afforded him to do it. HELSINKI (Reuters) - US Secretary of State Madeleine Albright said on Thursday that NATO would not accept Russia's demand for its own zone in Kosovo. Addressing the journalists in Helsinki ahead of her meeting with Russian Foreign Minister Igor Ivanov, Albright said that talks on the remaining sticking point between NATO and Russia were going on. Russian officials are mulling a plan on the final issues concerning the deployment of Russian peacekeepers in Kosovo, but no full agreement has been reached, a U.S. defense department spokesman said on Thursday. Spokesman Ken Bacon told journalists during a break in talks between U.S. and Russian officials the proposal held specific military details. He did not elaborate. Talks between the two sides have already yielded agreement on the command of Kosovo peacekeeping troops and on the use of Pristina airport, now under Russian control. "The American side has given a very detailed proposal on the last remaining issues to the Russians. The Russians are considering it...we are down to specific military details," he said. Bacon added that no agreement could be finalized until the whole package had been agreed upon and did not rule out the possibility that the talks, in their second day, could continue into Friday. "But as we've said all along, this isn't over until there is a final full agreement wrapped up and we are not at that stage yet," he said. Dacic said he was informed about the meeting in Herceg Novi between "a handful of foreign mercenaries" with US diplomat Robert Gelbard and Montenegrin President Milo Djukanovic, stressing that they "continue to work on instructions by countries that launched aggression against our country". BELGRADE (Beta) - Socialist Party of Serbia (SPS) spokesman Ivica Dacic said on Thursday that state of war in Yugoslavia would be lifted when the peace plan, namely the military-technical agreement on Kosovo and Metohija, was fully implemented. Recently, "there have been attempts from all sides at eroding the national unity", Dacic told a news conference, adding that it was also done in political parties' statements, which claimed that the authorities were delaying the lifting of state of war. Asked about how the national unity government would function after Radical Party vice-presidents, ministers and deputies resigned, Dacic replied that the Serbian Government had "worked successfully" and that it "should be maintained in the interest of the country and people". Commenting Serbian Orthodox Church Holy Synod's demand that the Yugoslav President and his federal Government resign and new officials, acceptable at home and abroad, take responsibility, Dacic said that "any church should be expected to side with its own country and people, not against them". He also noted it was "not the first time the Holy Synod makes destructive judgements that bring about rifts within our people". BELGRADE - Yugoslav airline JAT, after its fleet was forcibly landed for 85 days, resumes domestic flights on the Belgrade-Tivat line on Friday, JAT's Media Center told Glas Javnosti. Air traffic in Yugoslavia has been suspended since March 24, when NATO began its aggression against our country. The last prewar flight on the Podgorica-Belgrade line was carried out only a few hours before air strikes against Yugoslavia were launched. The plane on the first postwar flight, on the line between Belgrade and Tivat, takes off from Belgrade airport at 7:00 a.m. on Friday. Besides passengers, a group of Yugoslav and foreign journalist will travel aboard a 158-seat Boeing 727 plane. Until Golubovci airport is opened, passengers on JAT's flights to or from Podgorica will be transported via Tivat and then bussed to and from the Montenegrin capital. "I am not interested in tourist destinations of Patriarch Pavle"
BELGRADE - "NATO criminals are still harassing the Serbs in Kosovo. Verbally, they appeal to them to stay, but secretly they encourage terrorists to do anything to make their stay impossible. The Serbs should concentrate in some major towns and places where they make an overwhelming majority - Gnjilane, Pristina, Kosovo Polje, Kosovska Mitrovica... - in order to protect themselves from terrorists more easily," Serbian Radical Party (SRS) Vojislav Seselj told a news conference on Thursday. He added that the SRS favored the earliest possible lifting of the state of war, that they stuck to their resignations and would not support a minority government. 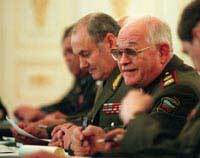 "A certificate of thanks awarding ceremony led by General Major Aleksandar Bakocevic looked like a tragicomedy. Thanks were granted even to Studio B television, which had caused us problems throughout the war. Certainly, it is not praiseworthy for those who were our partners until recently." Serbian ministers from the ultra-nationalist Radical Party will remain in the republic's cabinet until a new government is elected, the party's leader. "We'll work until new elections because we don't want to jeopardize any decision that's important for the state. But that will be only a technical job, with no heart in it any more," Vojislav Seselj, a Serbian Deputy Prime Minister, told a news conference. Such conciliatory behavior of the Radicals could be the first good news for Yugoslav President Slobodan Milosevic this week, after his political foes became more transparent and after the Serbian Orthodox Church demanded his resignation. Kosovo under a peace deal agreed to by Milosevic. On Tuesday, Serbia's President Milan Milutinovic, Milosevic's closest ally and a prominent member of his Socialist Party, issued a decree ordering the Radicals to continue working as ministers. "We're surprised we've been ordered to stay put in the government when we're obliged to do so by the constitution anyway," Seselj said, adding that radical ministers did not attend the Government meetings on Tuesday and Wednesday. The Radicals' resignation was widely seen by the Serbian opposition as either a bluff or a cynical deal with the government made up of the Socialists and the United Left led by Milosevic's wife Mira Markovic. Some analysts, however, have said the decree was a maneuver by Milosevic and his allies to avoid early elections, something all but the two ruling parties have been asking for. "The Radical Party is and will be in favor of new elections as soon as possible. We have always been for democratic solution of any crisis," Seselj said. Radical Party ministers are expected to remain in the government until the next session of the Serbian parliament scheduled for October when their resignations are supposed to be officially recognized. Referring to the Serbian Orthodox Church Holy Synod's appeal to the Yugoslav President and his federal Government to resign, Seselj said: "It is unusual for the Church to interfere in politics in such a way. It would be the same as the Federal Government demanded that the Synod and Patriarch resign." As for Patriarch Pavle's decision to temporarily move to Pec on Thursday, the Radical Party head said: "I am not interested in tourist destinations of Patriarch Pavle." How to Smuggle Havel In? PRAGUE (Beta) - Special UN Rapporteur for Human Rights in the former Yugoslavia Jirzi Dinstbir said he had no clear idea how an announced visit of Czech President Vaclav Havel to Kosovo would be "technically realized". In an interview with Prague daily Pravo, Dinstbir said it was unclear whether Havel would be "smuggled into Kosovo" or he would enter the province with a legal Yugoslav visa. "If a head of state wants to visit a foreign country - and the world keeps repeating that Kosovo is an integral part of that country - how can he enter it? Is anyone going to smuggle him in? Or will he get a Yugoslav visa? Or may Milosevic surprise him by welcoming him at Pristina airport?" wondered Dinstbir in the interview. PRISTINA (Beta-Reuters) - Two Italian KFOR soldiers were wounded as they entered a minefield, British KFOR troops spokesman in Pristina said, adding that it was the first case of serious wounding of members of the international peacekeeping forces in the southern Serbian province. The incident took place in western Kosovo, in the zone controlled by Italian forces based in Pec. Nataliya Trul, the Russian pianist and pedagogue, and Andrei Limaev, the student of the Moscow Conservatory, accompanied with the Belgrade Philharmonic Orchestra conducted by Aleksandar Vujic, held a concert in the Kolarac Endowment concert hall at 7:00 p.m. on Thursday. The program included works by Beethoven and Prokofiev. Fortunately, last night's concert in Belgrade and another two scheduled in Novi Sad and Subotica are held in peacetime. The war did not prevent you from holding concerts in our country. Do you believe that music can help in hard times? The only thing I can do is to play the piano. That is how I meet people. I want to show them they are not alone in the world and that I am on their side. All smart people of the world should side with you and be here now. I believe that music can help in a spiritual sense. My arrival here is a matter of mentality, rather than politics. How do you make your repertoire? I adore Beethoven, as well as some other composers, especially the Russian ones. My repertoire includes 30 major concerts and I intend to extend it further. I would like to perform the works of contemporary composers. Three years ago, I performed Benjamin Britten's concert in Belgrade, but such works are not basic determinants of my repertoire. Do you plan any other performances abroad? First I have entry exams at the Moscow Conservatory where I teach. After that, I'll rest. During the summer, I have a Chopin festival, where I will teach a master class, then there is a summer school for foreign students at the Moscow Conservatory. It is said that you like to be here, in Yugoslavia? There are two countries of the world I adore and where I feel as if I am home: Yugoslavia and Chile. I have many friends in Belgrade, as well as a longtime friendship with Lyudmila Gross. The list of clubs wanting to see Predrag Mijatovic in their ranks is getting ever longer, but it seems that Real Madrid's outstanding offensive player has already short-listed two clubs. FIFA manager of the all-European reputation Zoran Vekic has been intensively working on prospective contracts, as it is clear that Pedja is going to leave definitely not only the royal club, but also Spain. "Official negotiations will start early next week," said Vekic. "So, when the Spanish championship ends over the weekend, first we will discuss damage compensation with Lorenzo Sanza, and then proceed with the second phase of negotiations. I believe there will be no problems with Real Madrid so that Mijatovic will join his new "flock" soon. "President Alfonso Solance admitted frankly that he dared not "sell out" Milosevic after one year only. The best illustration of the pressures to keep our outstanding scorer in the club is the sum of money. Namely, Real Madrid offered in exchange for Milosevic 30 million German marks plus two of its players! Vekic makes no secret of the fact that Florentina and Olympik have a major advantage over other clubs, even though Borussia of Dortmund is eager to get its hands on our Pedja, too. "Florentina president Mario Checci is impatient to bring Pedja in and make a tandem with Gabriel Batistuta. It is this fact that can play a decisive role in Pedja's choosing of the new club. However, I must say that a vicechampion from Marseilles is also very ambitious. They have already reinforced their ranks in a bid to achieve good results in the League of Champions. If they want to make a major breakthrough, they need a Mijatovic-style player. And the Germans are also thinking along the similar lines. It seemed certain that Dragan Ciric was leaving Spain and joining Ljubisa Tumbakovic in Athens, but now he is highly likely to stay in the Iberian peninsula. "I don't know what progress has been made in negotiations between Greek AEK and Barcelona. However, several Spanish clubs are interested in engaging the ex-captain of Belgrade's Partizan. Apart from Saragossa, which was first to show interest, now the names of Celta and Real Sociedad are being mentioned..